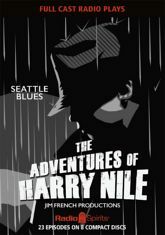 Harry Nile is a former Chicago cop, who quit the force after uncovering a vein of corruption. 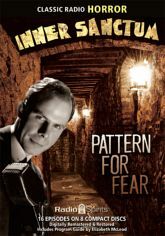 He stalks the rainy streets of pre-war Seattle on behalf of private clients with the help of his assistant, a lady named Murphy. Wherever there's a scheme afoot, radio's fabulous freelance insurance investigator is on the job to stop it! 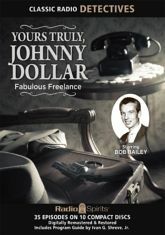 Bob Bailey stars as Johnny Dollar, picking up the ringing telephone to take on cases of double indemnity and double cross, foul weather and foul play. Tough crimes in a tough world call for a tough man to solve them! 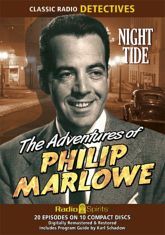 That man is Philip Marlowe, Raymond Chandler's king of the hard boiled detectives -- and you'll hear him in twenty radio-noir adventures produced by Norman Macdonnell and starring Gerald Mohr! Hit the road, Jack! Take a train, a plane, or even a ship! 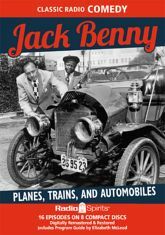 Wherever he goes, and however he gets there, Jack Benny is always good for a laugh. Mary Livingstone, Phil Harris, Eddie "Rochester" Anderson, Dennis Day, and Don Wilson come along for the ride in sixteen travel themed adventures in this 8-CD collection. Radio's greatest sleuths, bar none -- here are Sherlock Holmes and Doctor Watson! 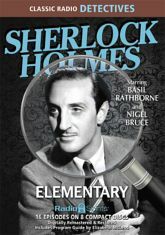 Deep voiced Basil Rathbone (with his deerstalker cap and chiseled silhouette) gives his definitive portrayal of Holmes, while Nigel Bruce (Hollywood's favorite jolly old Englishman) lends support as the delightfully amazed Watson. Step into radio's legendary house of horrors. The only program on the air to combine pitch-dark horror with sardonic humor, sending forth its undead monstrosities with rotting tongue pressed firmly into cheek. 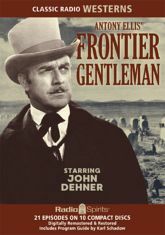 "Herewith, an Englishman's account of life and death in the West..."
John Dehner stars as J.B. Kendall, a reporter for the London Times who writes and fights his way through the Wild West. Roaming the territories in search of "colorful and unusual accounts," he has regular brushes with both the famous and the infamous. 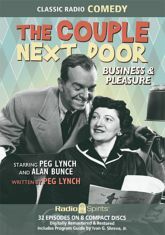 Mr. and Mrs. Piper are at it again -- navigating the ebb and flow of postwar suburbia in The Couple Next Door. The head of the household takes up a new hobby, navigates changes at work, and faces a few domestic dilemmas - all while his lovely wife stands by�and stands her ground! Peg Lynch and Alan Bunce star in 32 consecutive episodes from 1959, featuring Margaret Hamilton as Aunt Effie! Here are Western stories with an adult sensibility -- complex tales of difficult choices and moral dilemmas played out against the backdrop of frontier America. 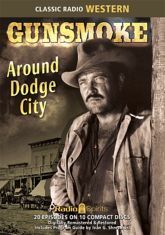 William Conrad is Marshal Matt Dillon in twenty thoughtful, exciting episodes of Gunsmoke! Next stop: Summerfield! 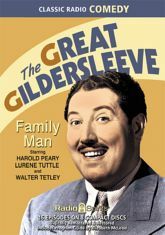 Join Fibber McGee's battling next-door neighbor as he sets out on a brand new life in this collection of early episodes of The Great Gildersleeve! Gildy's new family fast becomes the most important part of his life - and this bombastic bachelor quickly develops a strong sense of heart.